Poodle skirts, pink Cadillacs and hula hoops were all part of the festivities at Bailey DeLuca Baio's 50's Sock Hop themed first birthday party held at the Braemar Country Club in Tarzana, Calif., and delighted the guests with an ice cream float bar and hula hoop activities. 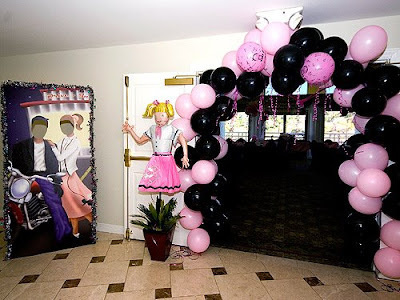 Guests were greeted with a pink and black balloon entrance and 50's themed photo stand ups. Mom helps Bailey with her party hat. Her outfit was custom-designed by Servane Barrau. The satin shirt and skirt set included a scarf and tulle underskirt, and was adorned with 50's icons: poodle, guitar, dice and record appliques. The dice were finished off with teal-colored buttons. 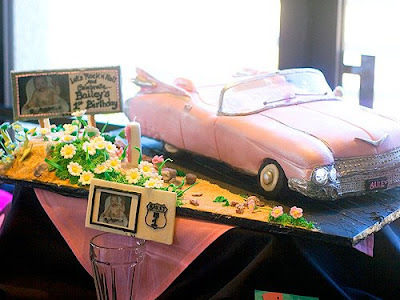 The pink Cadillac cake was designed by Jill Phillips of Jill's Cake Creations in Santa Clarita, Calif was handcrafted with fondant and included real working tail lights. I'll never forget many years ago I walked into a party and they had 50's music playing and a friend of mine who was in a famous 50's era band (I can not tell you his name) called me on my cell phone just seconds before the party. As I was putting my phone away the girl asked me, "Who was on the phone Mr. Mysterrio" and I said to the girl it was (name) from the 50's group (name) and she said oh wow. I did her party every year and each year she grew a bit older...At her 16th birthday I was invited back, I called my friend and he sang to her over my cell phone...Happy birthday, Happy Birthday Baby...and the rest of this true story is rock and roll history. The Party Expert,World Record Holder& Magician. I absolutely love the 50's theme. The cake is sooooooo cool! I just love the cake... absolutely gorgeous and original..
OMG! 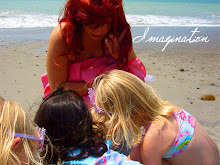 Your birthday theme party is really awesome and cool! My baby Anita's 1st birthday themed was Flintstones. Every child wore Flintstones' costume. I've expected a large number of visitors. My husband availed tent rentals. Sacramento, our hometown, has a lot of trustworthy tent rental services so it is easier for us to find those services. Great theme of birthday party. The cake is awesome!